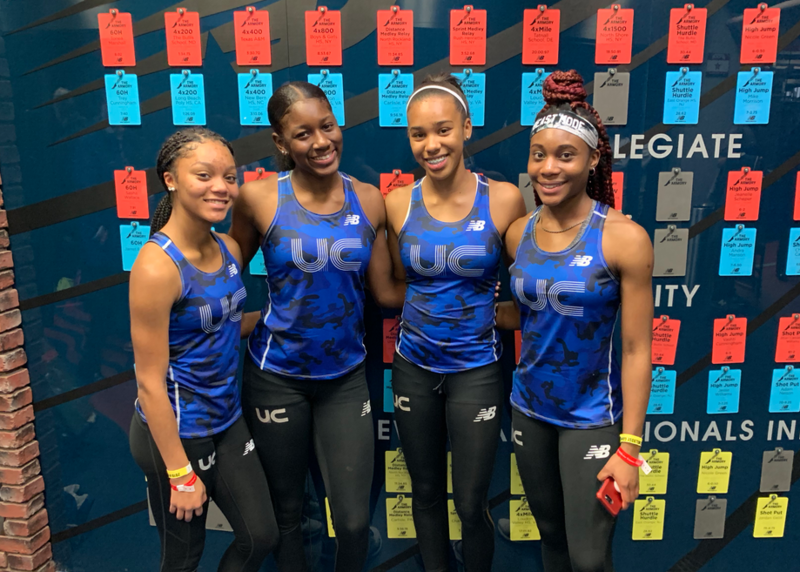 The Union Catholic girls, despite not having its regular lineup in either race, still put on a remarkable show by sweeping the girls 4×400 and 4×800-meter relays in dramatic fashion at Saturday’s prestigious 112th Millrose Games at the Armory in New York. In the 4×800, UC threw down a red hot 9:07.44, the fastest time in the nation this season, the eighth fastest time in NJ indoor history, and a new school record. The Vikings finished just ahead of Mt. De Sales of Maryland, second in a US#2 9:07.87. UC anchor Leena Morant went to the lead at the bell on her way to a 2:11.28 anchor split and she held off Juliette Whittaker of Mt. De Sales, who split 2:08.96. Union Catholic’s first three legs on the 4×800 were handled by Morgan Williams (2:18.06), Jerika Lufrano(2:16.47), and Ashleigh Patterson (2:21.63). UC, also the state leader in the 4×400 at 3:50.93, came back later to run 3:53.40 and rally to finish first in the Suburban Division 4×400, edging Rancocas Valley, second in a NJ#2 3:53.97. Millville was third in a NJ# 3:55.04, and Ramapo sixth in a NJ#4 3:58.20. UC’s 4×400 lineup consisted of Avery Jordan (59.83), Sydney Tucker (57.88), Zamira Ysaac (58.90) and Chidumga Nkulume (56.81). Nkulume got the baton in the third place, but didn’t stay threre for long as she overtook both Rancocas Valley and Millville to secure the win for the Vikings.